The other day I bought on the market wild garlic - No, not those pickled "feathers" with the smell of garlic ... oh, and it's hard to pass by these pickles :) - and fresh green leaves, similar to the lily of the valley. What to do with it, frankly, did not know, but it took (and excitedly talking about salads, and side dishes about her) and I took :) Thus began my acquaintance with wild garlic (once on arrival to prepare a salad - very tasty left). And today, to find the house "bored" avocado, guacamole decided to cook ... of garlic. The idea was born almost immediately: because the taste of the leaves is very spicy (reminiscent of the taste of garlic, but after the fact - without odor resistant), a little bluff, leek overshadowed excellent "freshwater" avocado. In addition, adding a little lemon juice, pepper, peanuts, you get the perfect taste of the guacamole, which is, in my opinion, inferior even to the original recipe! And yet, for example, from wild garlic can be cooked a wonderful pesto, simply replacing the wild garlic basil to see. klassicheysky pesto recipe in my performance. I would like to say a few words about the benefits of garlic, because I was just shocked these wonderful leaves. The plant is rich in vitamins A, C, PP, V1, V2, V3, V6, V9 (Folic acid), minerals (calcium, potassium, sulfur, fluorine), trace elements (boron, iodine, manganese, iron, copper, selenium, fluoride, zinc), essential oils, amino acids and useful (!) Fats. Green garlic in raw form does not allow to accumulate cholesterol in the blood, it stimulates the cardiovascular system, strengthens the coronary vessels, normalizes the metabolism. Volatile and biologically active substances cause bactericidal, tonic, antiparasitic, diuretic and tonic properties. According to the content of vitamin C Ramson surpassed most of the citrus crops, a few stems of greenery useful with more than cover the daily need in ascorbic acid! I could go on, but I will not try to be clever, and move on to the recipe. 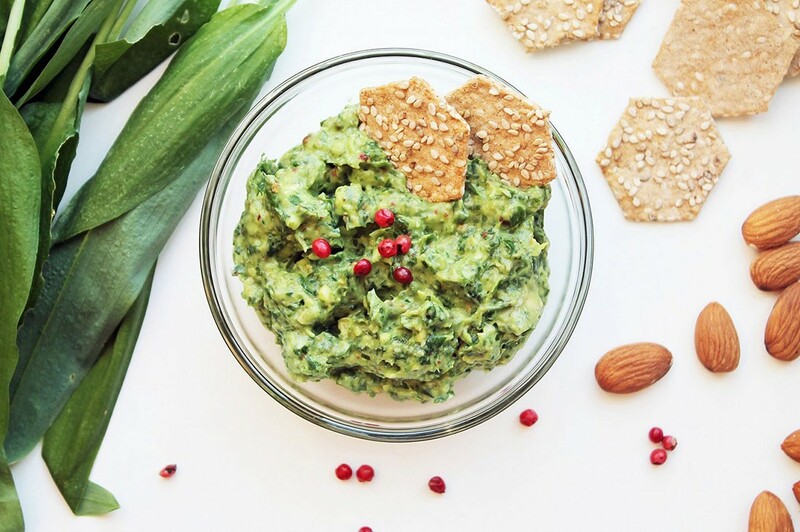 Guacamole of garlic - a wonderful snack, rich in fiber, protein and healthy fats. I'm sure if you love avocado and / or savory dishes, you are sure to appreciate this truly delicious treat. *You can also use and walnuts. **Excellent fit and other unrefined oils: mustard, linseed, etc., to your taste. Avocados are cleaned, cut, send in the bowl of a blender. There also - wild garlic, nuts, butter, lemon juice, parsley, seasoning and salt. Carefully grind the mass until smooth (here at your discretion: either to a smooth cream-state or leaving large pieces). Guacamole is prepared from garlic. Serve it with crackers, bread or toast, pancakes. I also like the use of garlic as a guacamole sauce spaghetti, Any vegetable and meat dishes - it's just a song! Recipes other interesting snacks you will find here.